Your Excellency, you have had a very rich diplomatic career. In which position do you think you gained the most experience or where have you faced some of the most difficult challenges? I have had some interesting positions in my career, the most challenging was the post of the chief of the cabinet of the Foreign Ministry. In what ways was the post challenging? You are confronted with all international questions the ministry is dealing with. It is also preparing important decisions for the Ministers, indeed it is quite difficult. Why did you decide to become a diplomat? Diplomacy is a very interesting place of work, you prepare good conditions of understanding countries, nations and it is quite a challenging thing. Diplomacy is a strange animal. If everything is running well, people usually say, why do we have diplomats, they are not needed. However, in case of crisis, like these we have nowadays, diplomacy is being demanded. My point is to say that it is better to have preventive diplomacy, preventing crisis, than solving crisis, the latter is much more difficult. 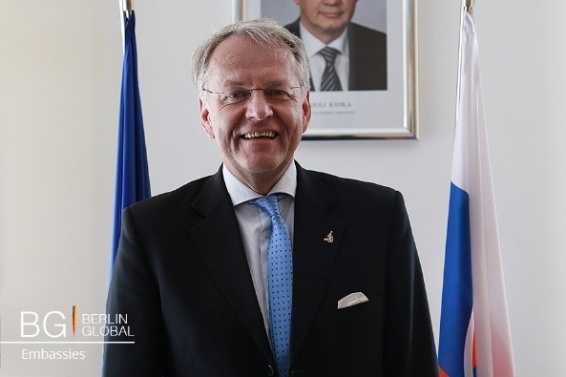 How important is the role of being the Slovak Ambassador to Germany in your opinion? Germany is an important country not only for Slovakia but also for other parties. It is definitely an honor to serve in this position. How have the relations between Germany and Slovakia changed over the years and in what ways is the Embassy of Slovakia in Berlin promoting Slovak culture? We have excellent diplomatic relations with Germany and it is one of our key partners. We have very intensive economic relations with Germany. The economic turnover between the two countries was 26 billion of euro. The relations between the 2 countries are very good, excellent. Regarding the cultural diplomacy, there is a whole spectrum of very interesting events that we have been preparing thelast weeks and months. I would stress some of them. As a highlight I would bring to your attention a project that was prepared in cooperation with the Slovak national theater and a German theater in Berlin. It was regarding a piece written by a Georgian German, Nino Haratischwili, Das Land der ersten Dinge. It was performed for two years in Bratislava and Berlin, and it was successful. I was personally glad to see this piece, because there were both German and Slovak actors playing together. It was a promotion of Slovak culture and also a projection of our good cooperation between the two states here in Berlin. Another thing I would like to stress is the exhibition of our architecture, which was prepared in Berlin, it had a positive resonance here on the architectural scene. I am proud that the modern Slovak architecture is at the world level. Maybe I have also something to say about the upcoming events. We are opening next week coronation festivities, which have been in Bratislava for centuries and this will be opened next week. We are having an event in Aachen, than in the following days there is going to be opened the exhibition of Slovak glass and design in Kunst Palace in Dusseldorf. Moreover, at the end of December we will have a gala concert in the Berliner Dom, on the occasion of the Slovak presidency of the EU, when Gruberova and Preclik will be singing. How would you define Cultural Diplomacy, and what does it mean to you? How can we use cultural diplomacy to strengthen the relations between Slovakia and Germany? Culture plays always an important role between countries. It is extremely important for us that we are present on the German scene. We are very active, we have the Slovak institute here which is preparing numerous events. We are putting a lot of emphasis to this part of our activities. Can you give us an example of a time in which you were involved in a successful cultural dialogue and how do you see the role of Cultural Diplomacy today? 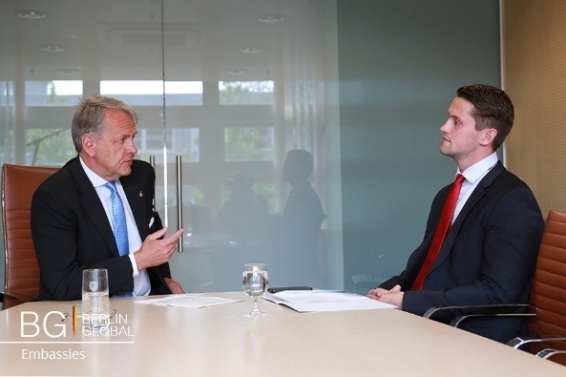 I think the role was not diminished and is still part of our activity which was present since the existence of the Slovak republic and we have also institutes in other countries which are taking care of the bilateral cultural relations. Therefore I don’t expect we will diminish this role of our activities in this area. I am meeting a lot of young students, that work as trainees and preparing themselves for the job. If you want to do something and it is really your wish, than you can achieve it and invest time, study for example foreign languages and then you can achieve it. I will give you an example, by chance I was studying with the current Slovakian foreign minister, which is now one of the nominees for the post of the Secretary post of the UN. If somebody had told us 30 years ago that one of us would have become a candidate for such an honorable post, maybe we would have laughed about. The time is coming, people are prepared, with experience, with good qualification, and this candidacy has good chances to be successful. Would you recommend learning more foreign languages or do you believe that English is sufficient in diplomacy? English is not at all sufficient. English is the first prerequisite, without English you cannot do anything in international relations. Definitely you need to speak more languages. Myself I speak seven languages. It is a prerequisite to understand people, what they mean, what they say. There are excellent interpreters but life communication is always better. I wish your Institute much success in preparing nice events, nice projects. We are ready to be cooperate with your organization.